Cafe and coffee shop on George Street, part of a small chain. It opened on 13 November 2018. Accessibility: No steps to get in, and no steps to the accessible toilet (though this was out of order on our January 2019 visit). One step to the other toilets. It was previously a fashion accessories and wedding dress shop called Bonita photo, but this closed down some time between September 2016 and January 2017 photo. According to a photo on Flickr, it had been Bonita since at least July 2009. The premises were vacant and stripped out photo as of January 2017. Still vacant as of March 2017, October 2017, and February 2018. 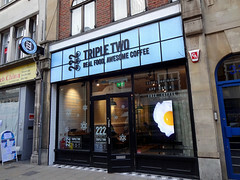 As of October 2018 it was still vacant but under refurbishment to become a branch of Triple Two Coffee. This opened on 13 November 2018.